Feb. 26, 2018 - Located in the small community of Haute-Aboujagane in the southeastern part of New Brunswick is the family-owned and operated G.L. Wood Products. Established in 1985, the value-added remanufacturing company produces a variety of wood products including wooden boxes, pallets, stickers & laths, and dunnage. G.L. Wood Products is situated a few miles west of the Atlantic Ocean where the local economy relies heavily on the fish and wood products industries. The company capitalizes on both markets and first came into business by primarily processing wooden boxes for shipping fish domestically as well as to the northeastern United States, Haiti, Dominican Republic, and Iceland. G.L. produces various sized boxes for smoked herring, cod, halibut, oysters, potatoes, berries, and boned salt ranging from five pound to 300 pound capacities. Donelle said the industry prefers wooden boxes compared to cardboard or waxed curtain cardboard boxes because clients generally reuse the quality wood for another purpose, especially in countries such as Haiti and the Dominican. Wooden boxes produced by G.L. were originally processed by double arbor circular saw blades, but the business had issues with the product consistency and quality. In 1995, G.L. purchased a six-head horizontal resaw manufactured by Wood-Mizer in order to increase their efficiency from the thin-kerf bandsaw blades it utilized. After buying heat treated dry spruce 2 x 6 lumber, the multi-head resaw splits the boards horizontally in half to get two ends of the wooden box. For the box sides, bottom, and cover, another 2 x 6 board is split into five pieces through one complete pass on the six-head resaw. Once the correct size of box pieces are prepared and custom printing of a company’s name and product description is added, the pieces ship to the customer unassembled which saves on shipping costs and cargo space. According to Donelle, the operation became more efficient when running their equipment at an optimal speed to process up to 28,000 board feet during each nine hour work shift. 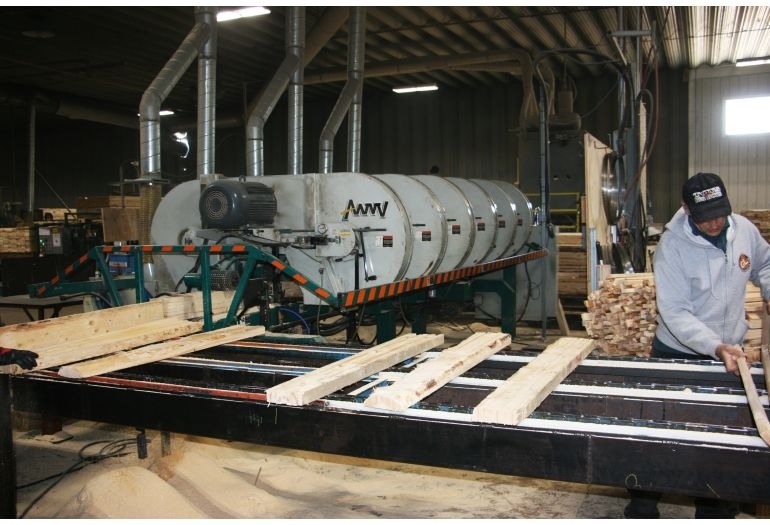 For more than 20 years with the same resaw, the company has processed six million board feet of dry spruce annually which is equal to more than one million wooden boxes produced for the seafood shipping and packaging industry each year. Along with the success of wooden boxes, diversification of products has been pivotal for the growth of the business. Although the Atlantic provinces are not considered to be a large manufacturing sector, in 1996 G.L. identified a market to produce and sell wooden pallets for the industry. Although pallet production is supplemental to the primary wooden box business, the company produces more than 300,000 pallets per year for companies throughout Eastern Canada and the United States. In 2005, G.L. further diversified and added a second Wood-Mizer six-head resaw to begin producing kiln stickers and laths for local sawmills in the area. For manufacturing the stickers and laths, G.L. takes a 2 x 6 piece and passes it through the six-head resaw vertically to produce stickers. Almost nothing goes to waste in the operation as byproducts prove profitable as well with the selling of kindling from below-grade kiln stickers along with shavings and sawdust sold to local farmers. The scheduled management of their bandsaw blades has also proved beneficial by sharpening each blade as many as six times instead of throwing them away at the first signs of dullness. G.L. depends on Wood-Mizer blade sharpeners and tooth setters to maintain the performance of their own blades on-site and has been using Wood-Mizer bandsaw blades for the past several years. Today, G.L. is making wooden boxes more than ever, but has now diversified into additional wood products and markets to establish a sound blueprint for sustained success. Throughout decades of lucrative operations, Donelle said their accomplishments have come from employing good people and treating them as family.